A lot is at stake on the first weekend of April in Vancouver, and I’m not referring to Canada’s Davis Cup quarterfinal tie with Italy at Thunderbird Arena. The British Columbia government was bidding to bring the International Indian Film Academy awards to Vancouver in June 2013, but negotiations broke down with producer Wizcraft International of Mumbai in May 2012. Elephant in the room: Clark clutching the TOIFA trophy. 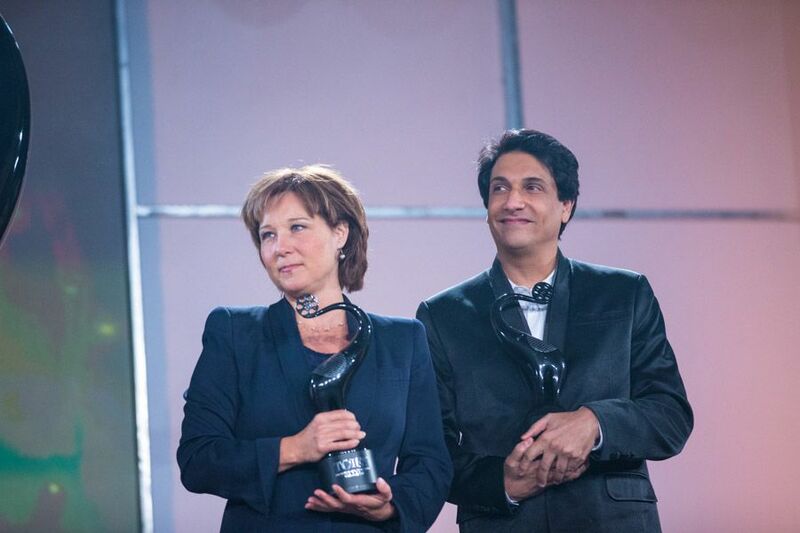 So Premier Christy Clark created a pre-election Bollywood awards show under the guise of promoting B.C. as a tourist destination for Indians with a broadcast on Sony Television in India. It was announced Jan. 22 — just 72 days before the event. I took a critical look at the $11 million-plus, taxpayer-subsidized event on The Investigators on CKNW AM 980 on Jan. 25. Here is the podcast. Depending on how you look at it, TOIFA is the scandal-plagued BC Liberals’ last hurrah before an election they’re expected to lose or a desperate, multicultural outreach ploy to gain votes from the 260,000-plus Indo-Canadians in B.C. Not surprisingly, no mainstream, Canadian brand has sponsored TOIFA; sophisticated companies tend not to invest in unproven properties, especially when faced with such little advance notice. Only five companies well-known within the Indo-Canadian community have come forward. The values and structures of the deals have not been disclosed. Toronto’s 2011 IIFA had 18 months lead-time and was able to compile an impressive sponsor roster, topped by CIBC, one of Canada’s biggest banks. Quite simply, we may never know how our money was spent. Times of India Group is a private, foreign company. As such, it is outside the FOI law. The government’s contractual sleight of hand is a likely legacy of the 2011 IIFA event in Toronto, where the CBC and other media outlets eventually got detailed spending reports via FOI. The news only gets worse for TOIFA, after the Surrey Board of Trade issued a March 28 news release slamming the promoter for failing to schedule an event in Surrey, where 30% of residents are South Asian. The bid book for IIFA (which you can read here) included letters of support from Mayor Dianne Watts and Surrey Board of Trade CEO Anita Huberman. Suggested events included a Bollywood film festival at Surrey’s Strawberry Hill cinemas. I broke the news about the imminent Surrey snub on March 6 in Business in Vancouver. Blaming the Times of India Group for the snub doesn’t add up. The BC Liberals let the contract and hold the purse. As the saying goes, he who pays the piper calls the tune. Might Clark and co. have punished Surrey for turning down the Gateway Casino application to city council the weekend before the TOIFA news conference? According to Vancouver Desi, Surrey’s Sikh community played a key role in the anti-casino lobby. A March 2 TOIFA fashion show was held at the River Rock Show Theatre in Richmond — a casino in a municipality other than Surrey. TOIFA has also stirred anger within the Indo-Canadian community. Vikram Bajwa, a disenchanted BC Liberal in Surrey, has announced plans for a protest outside TOIFA events to oppose the taxpayer-subsidy. Have you obtained TOIFA tickets from a source other than TicketMaster? How much did you pay? Did you get them for free? Please email me and tell me your story. One of the links on your article leads to an online paper called ‘LINK’ and that article states that Save BC Film are “eager to high-light the issue” of TOIFA. Let me state for the record that Save BC Film is in no way involved in planning the protests, promoting (high-lighting) the protests, or in any way connected to the protests that have been planned for the events surrounding TOIFA.